Whenever a patient feels that he has suffered some harm or injury due to improper medical treatment or incorrect diagnosis by a healthcare provider like a doctor, technician, nurse or medical worker, he can file a medical malpractice case against them. For a claim to exist, it is important to prove that the medical service provided by them was below standard. 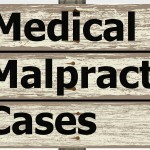 Medical malpractice cases have to be filed within a certain time frame. Anyone seeking a claim should first try to solve the matter by discussing it with the concerned medical professional and giving him an opportunity to make amends or find a solution. If this doesn’t help he can approach the relevant medical licensing board which can issue warnings to the professional or guide you. It is necessary that a claim should be filed within a time period from the occurrence of the injury. Each state has different statute of limitations that inform you about the time limits within which a claim must be made. One should know the statute of limitations of his state before making claims. The patient needs to file a certificate of merit that is issued after medical assessment of your medical records by an expert, another physician. This helps in proving that the original healthcare provider faltered while performing his medical duties resulting in your injuries. It is beneficial for patients to go for out-of-court settlement since these cases are time-consuming and costly. Also, insurance companies reject a lot of these cases, which means you will receive less or no compensation if you pursue the case in court. An experienced medical malpractice attorney must be hired for your case, which can give you detailed information about the legal standing of your case and can guide your future of action.